I was not born in the 8-bit era, neither the 16-bit. By the time I knew games it was already the 64-bit era, but yet Astro Duel Deluxe is a game that readily seemed familiar to me. Perhaps I played it many years ago as a flash game, perhaps I played it somewhere on some console; I cannot remember. But it is this familiarity that makes Astro Duel Deluxe so much nicer to play with. Fast forward to today, the game still holds up strong, even on a modern console like the Nintendo Switch. Though the game’s mechanics are timeless, new players may still find themselves needing some time to get used to. There is really no shortage of controls for this game. You can play it with the Nintendo Switch Pro Controller, with two joy-cons, with one joy-cons or even using the Switch’s touch screen. As I do not own a Switch Pro Controller, I only get to try the other control variations. While using two joy-cons is much easier to play compared to one joy-con, both methods are largely similar in controls. The controls with the greatest difference is the touch screen, where you can only steer in one direction, but otherwise, allows you to crowd around and play controller-free. I like it how they have a handy warm-up round just before the match, allowing all players to familiarise themselves with the controls. Astro Duel Deluxe on the Switch supports up to 6 players in chaos mode, something you don’t see everyday and everywhere. You can gather a group of 6 friends or wrestle your way through five other CP. From experience, the CPU opponents can provide quite a substantial challenge. Surprisingly, I find that humans are simply easier to defeat than CPU, especially when setting the CPU to hard as all my human friends tend to have some sort of motor-skill problem while the CPU can control the ships flawlessly. However, that is not to say the CPUs are invincible, they don’t seem to be able to collude or lay intelligent traps, they are just better at control. Still, the challenge remains. You’ll still feel a sense of accomplishment when you lead your team of three against the CPU’s own team of three. Matches in the game are fast paced. While there are a few strategies such as rushing for powerups or avoiding choke zones, the approach tends to be similar, fight or flight. The game will trigger a Sudden Death mode when it thinks you are taking you own sweet time and avoiding confrontation. Vertical kill bars will move towards the centre, reducing the area of the battlefield. While the moving kill bars were supposed to congregate players to the centre for a serious death match, I find myself being able to win most of the time by just focusing on not hitting the kill bars. Expert players may be able to multitask their attack and avoiding of the kill bars, but it is a heavy risk if you over manoeuvre. The graphics for the game is timeless. Maps range from dark, to red, to colourful and each of them was well crafted in its own way. It is hard to imagine the game being played in anything other than its retro graphics or flat 2D plane. If anything, it is the retro graphics that made the game work in ways. However, there are just not enough maps to go around. In about an hour of gameplay, we found ourselves recycling similar maps over and over again multiple times. Along with the small amount of maps is also and lack of any campaign/progression levels. This made the replayability of Astro Duel Deluxe very low. 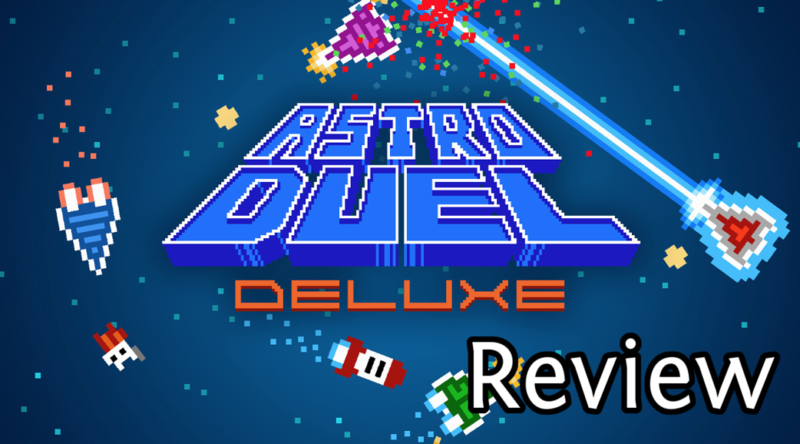 While the multiplayer portion is great fun, Astro Duel Deluxe is unfortunately hardly the kind of game that you will call your friends over just to play. Luckily for the game though, the Switch’s portability means that the game can be played on a whim, anytime, anywhere without constricting yourself to the home. This allowed for spontaneous quick gameplay, which I find is one of the key selling points for the Switch version. In conclusion, though Astro Duel Deluxe suffers from the lack of replayability, it is a game that excels at what it wants to do. The multiplayer is chaotically fun and it is easy to find yourself deeply engrossed in the game, something not many games without a storyline can say for itself. For our verdict, if Astro Duel Deluxe is a bowl of hot soup, it is a delicious one just like grandma used to make, just that this time grandma may have cooked a little too less for us to feel full. A review copy was provided by Panic Button for the purposes of this review. We’re having a giveaway for Astro Duel Deluxe thanks to our friends from Panic Button. For more information on how to qualify, click here.